The company points to higher compensation costs as a cause of its falling net income. Schwab missed estimates in Q1'15. 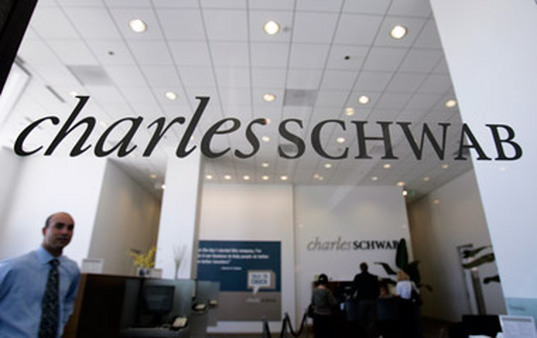 Charles Schwab (SCHW) said Wednesday that its first-quarter net income fell 7% from last year to $302 million, or $0.22 a share, while revenue improved slightly to $1.53 billion. Both results, however, missed analysts’ estimates and fell short of the company’s own Q1 outlook, “primarily due to the earlier timing of certain compensation expenses,” the firm says. In addition, its pretax profit margin declined to 22% from 28% last year. Asset levels, though, improved. “Our strong client momentum continued in the first quarter of 2015, as our innovative, full-service model continued to resonate with investors. We gathered $34.2 billion of core net new assets during the first quarter, a 6% annualized organic growth rate,” said CEO Walt Bettinger, in a statement. “Net new assets from retail investors were the highest since the first quarter of 2008, totaling $12.5 billion, up 16% sequentially and 28% year over year. Clients have now entrusted us with assets totaling $2.52 trillion 9% above the March 2014 level,” explained Bettinger. Net interest revenue grew 6% in Q1 from the prior year to $588 million. Schwab’s Advisor Services business had 9% year-over-year and a 2% quarter-over-quarter jump in assets to $1.13 trillion. Net new assets for the unit were $5.5 billion in Q1 and include an outflow of $11.6 billion related to Schwab’s planned resignation from a cash management relationship, the firm says. During Q1’15, the firm launched Schwab Intelligent Portfolios, an automated investment advisory service. It plans to introduce Institutional Intelligent Portfolios for its RIA clients in the current period. OneSource, Schwab’s commission-free ETF platform, has client balances of $47.1 billion as of quarter-end, up 65% from a year ago. Proprietary ETF balances reached $31 billion on March 31.